Glass artists Benjamin Edols and Kathy Elliott have been working in partnership since their first joint exhibition at the de Vera Gallery, San Francisco in 1993. Their collaborative works involve a two-stage process of hot and cold glass techniques. After Benjamin has blown the vessels, Kathy cuts the glass on a lathe, using stone and diamond wheels, to create an organic surface of lines and planes. Both artists see their collaborative work as being more than the sum of two ideas. Kathy explains: “For us, glass is a medium for colour and light as well as an opportunity to explore design and we try to use these uplifting elements in ways that are original.” Ben and Kathy’s ethereal glass sculptures are inspired by close observation of the natural world, in particular their response to the shapes, textures, colours and fluidity of leaves, seed pods, blades of grass and succulent fruit. Their most recent work continues to further explore the technical boundaries of carving glass, as well as exploring the notion of expression through line. Their exquisitely crafted abstract and organic forms are often highly coloured, featuring low and high relief surface decoration, and are beautifully brought to life through the play of light. Benjamin Edols studied initially at the Sydney College of the Arts, then undertook a post-graduate diploma at the Canberra School of Art in 1991. 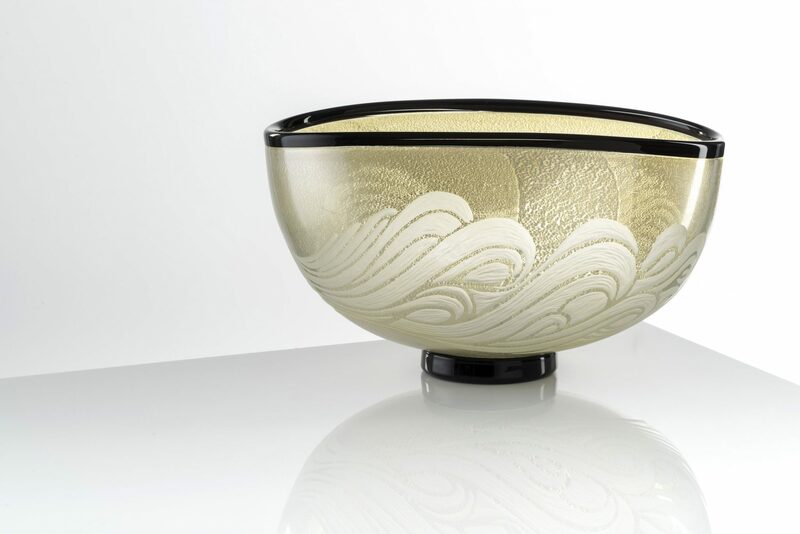 Kathy Elliott received her BA from the Canberra School of Art in 1991, after which she travelled to the United States, working her way through public and private glass studios. Together, they have exhibited widely in Australia, as well as showing in Japan and the USA. Their work is represented in the collections of the National Gallery of Australia, National Gallery of Victoria, Queensland Art Gallery, Powerhouse Museum, Art Gallery of South Australia, Artbank, Museum of Arts and Design (New York), Corning Museum of Glass (New York) and the Victoria and Albert Museum (London).